This is the first step in providing personalized care. By learning about your specific needs, Dr. Nauman can make a more specific treatment plan to help you fulfill them. As she explains the results of your exam and sleep study, she’ll be happy to answer any questions you might have. With oral appliance therapy, Dr. Nauman can provide you with a comfortable alternative to CPAP. 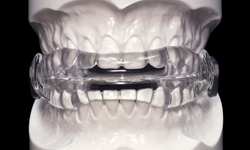 Your oral appliance will be custom-made to reposition your tongue or lower jaw while you sleep. Repositioning your tongue or jaw lets air reach the lungs more easily, contributing to a better night of sleep for both you and your partner. A more restful night of sleep is possible with oral appliance therapy.